John Marshall: The owner and founder of Total Body Works Personal Training. John is an experienced Personal Trainer and Athletic Coach with a gift for finding the inner athlete within. Over the past 20 years Johns profile of clientele has ranged from pre-teens to seniors, elite athletes to the sedentary , physical therapists, doctors, and everything in between. John loves working to help people achieve personal goals and overcome limited mindsets. He has also helped people regain balance and control skills after severe brain injuries. He creates individual performance based programs unique to your goals, and they are designed exclusively in a private facility. John started his career at Baylor College of Sports Medicine over 20 years ago and has been certified and educated through ISSA, ACE, and PFIT programs, and keeps his education an ongoing process with clinics and webinar based training through NSCA, Michael Boyle, Westside Barbell, ARPwave and USA Cycling/BMX etc. John is also current on a a few cycling disciplines-certified as a USA Cycling Coach and USA BMX Certified Coach. John enjoys anything that is outdoors, but particularly cycling. He is an accomplished competitive cyclist with results ranging from top 5 in mountain bike racing to Colorado State track Sprint Champion. In 2004 he was a member of the National Team that went on to win the National title in track cycling. That same year he was a member of the US Masters World Championship team competing in Manchester England. He now is the strength and conditioning coach for the local BMX track, Pikes Peak BMX, and is training his 16yr old son and other members of his team to become champions. John lives in Colorado Springs, Colorado with his wife Jenny and 3 children Autumn, Skye, and Ryder. John is also now helping people in pain through ARPwave Neuro-Therapy.Click here for more information! Jenny now has a desire to help anyone achieve physical fitness no matter what their age or ability level is. She believes that we are ALL created for greatness and that movement is life- if you don’t move, your quality of life will deteriorate. She is dedicated to helping you achieve your personal goals- whatever they are. 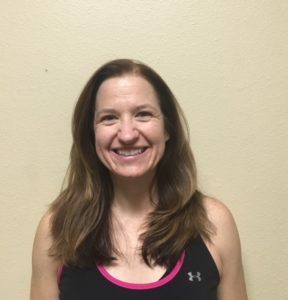 Outside of the gym Jenny enjoys spending time with family and friends, hiking, and serving at church. Jenny lives in Colorado Springs with her husband John and 3 children Autumn Skye and Ryder. Tyler has certifications through NASM in corrective exercise, nutrition, MMA and sports enhancement. He started in sports from a very young age and gained a passion for training while serving in the military. Unfortunately, he suffered some injuries while serving that caused him chronic pain and a loss of mobility and quality of life. Not ready to give up and except this as his life, he set out to learn all he could about how to fix himself and that lead him to become a certified corrective exercise specialist. While in school he also became very interested in nutrition and then put in the work to become certified as a nutrition specialist. Tyler has a background in Boxing and MMA and this lead him to both his MMA training certificate and his sports enhancements specialist certification. Tyler’s training philosophy is based upon form, function and improved quality of life. He is always looking for ways to continue his education, so he can better help the people who want to improve their everyday quality of life. Tyler is excited to be part of the Total Body Works team and to help the people of Colorado Springs. Tyler currently lives on the south side of the springs with his wife Lindsy and their many pets. When he’s not at work he enjoys getting up into the mountains, hunting and fishing. WHAT IS A PERSONAL TRAINER? Today with our busy lifestyles, careers that have us set up to save the world, and the time commitments that come with that and not to mention family...Who has time to figure out health and fitness? That is where we as professionals come in to take care of all of that for you, and make things a system that can merge right into your current life. If you are looking for the tools to succeed, this is the day to make that choice that changes your life forever. Call us today for the keys to your new and improved life! Let us help you get in the best shape of your life for that special day. Call now! Take a look at how our past clients are thrilled with their results. Call us today to request your consultation with our personal trainers!